In the bustle of everyday living – it is easy to forget or overlook the basics for laundry day. We all want white colored clothes in the laundry to stay white (not dyed pink from an unfortunate mixup with a red shirt). And, we want clothes with bright colors to stay bright and not fade. Finally, we want our clothes to come out of the laundry in the same shape as they went in (no shrinking). Examine the Washer Settings and inspect the inside of the washer. Select the correct wash temperature and wash cycle. Drying Clothes: Clean the lint filter; set the correct dryer temperature for your clothes. Simple, right? Let’s look at some details. It is very important to sort your laundry by clothes types! Sorting can be done before arriving at StarBrite Coin Laundry – or after you get here. Sort the laundry into separate stacks. To prevent fading – turn items inside out. For items with sequins or decorative designs, turn inside out. Check and empty pockets; unroll sleeves, pants and socks. Pre-treat for Stubborn Stains: Follow directions on the bottle. Read and follow the Laundry Care labels in your clothing. Always inspect the inside of washing machines and dryers before putting clothes in. It is possible that the individual before you washed something that left lint or other unwanted items. Please Alert our Attendant immediately if cleaning a washer or dryer is needed. Normal / Regular Cycle Best for whites, sheets, towels, underwear, socks and heavily soiled items Removes stains and dirt; cleans durable fabrics. Uses fast agitation in the wash cycle, and a fast spin cycle. Delicate Cycle Best for wool, silk, and any other, fragile garments that say “gentle wash” on the tag Gently cleans delicate items. Uses slow agitation in wash cycle, and a slow rinse cycle. Permanent Press Cycle Best for jeans, many non-cotton items, synthetic fibers such as rayons, knits, polyesters and acetates Cleans every-day clothes that wrinkle easily. Uses fast agitation in the wash cycle, and a slow spin cycle. Always check the water temperature setting before you get started. Using the correct wash water temperature can mean the difference between clean, bright clothes and not so great results. Cold Setting Dark colors, bright colors that may run or fade, delicate fabrics, lightly soiled fabrics, anything that might shrink Cold water saves the most energy while also being the most gentle on clothing. Warm Setting Synthetic, permanent press fabrics, towels Good cleaning power for preserving colors without much fading or risk of shrinking. Hot Setting Whites, cotton fabrics, socks, bed sheets, heavily soiled garments, baby clothes Hot water removes the toughest stains and gives garments a deep clean. Before drying, check clothing care labels. Some fabric types cannot be tumble dried. Below, a quick guide to fabric care label drying symbols. Pay attention to the laundry labels in your clothing. • Clean the dryer lint tray before drying a load of clothes; this ensures the dryer will function as effectively as possible. • Thin or delicate items should be dried on medium or low heat (important). 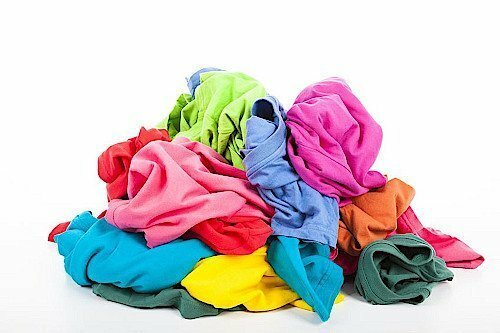 • When removing clothes from the dryer – always fold or hang clothes as soon as possible to prevent wrinkling. • Washing Large Items: It is important that there is enough room in the washer for water and detergent to circulate well; may need to use large item washer. • Drying Large Items: It is important that there is enough room in the dryer for items to circulate well; may need to use large dryer. • Ask the attendant for help if uncertain about the appropriate size machines for your loads. For specific tips on use of our laundry machines – please see our pdf. We have a completely remodeled laundry area. Clean, bright – with great pricing and service! To provide our customers a safe, clean, bright environment with a friendly staff to take care of all their laundry needs. 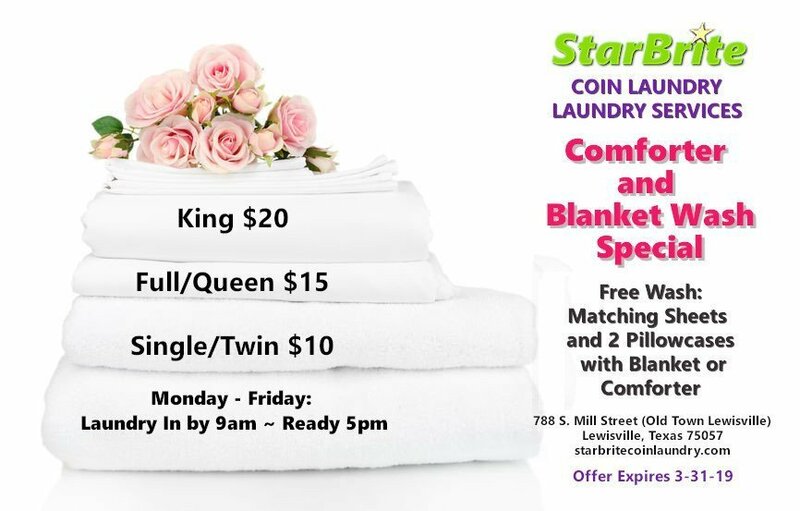 StarBrite Coin Laundry and Laundry Services has comforter and blanket wash, dry and fold Monday-Friday, 8am – 5pm. Laundry in by 9am – Laundry ready for pick up at 5pm that same day. 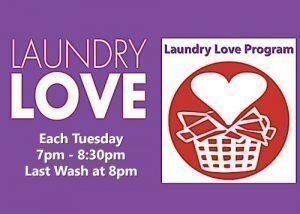 Our Laundry Love program is each Tuesday 7pm – 8:30pm. The program is sponsored by FaithNet churches from Lewisville, Flower Mound and Highland Village. 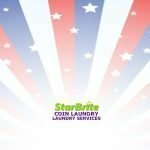 StarBrite Coin Laundry and Laundry Services and FaithNet provide the payment for all washers, dryers, dryer sheets and detergent. See Laundry Love Program for details; and how the program works. 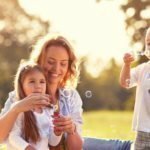 Lewisville Wash and Fold Service – Enjoy Your Weekends! Like to Gain 3 Extra Hours This Weekend? 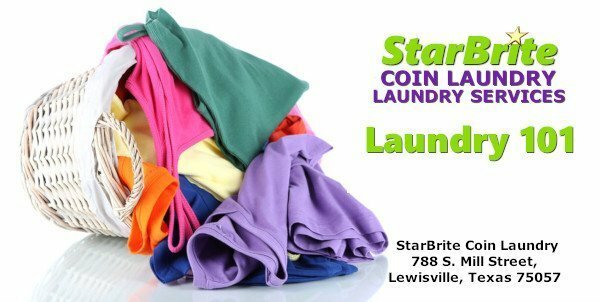 Let StarBrite Coin Laundry Do Your Laundry! 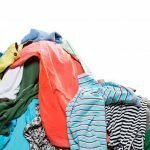 What Could … [Read More...] about Lewisville Wash and Fold Service – Enjoy Your Weekends! Ready to start gaining more free time? Let us do the laundry! 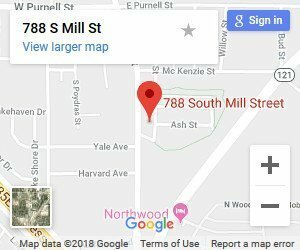 We are located on Mill Street - just .5 mile north of Hwy I35-E - in historic Old Town Lewisville. Copyright © 2019 StarBrite Coin Laundry, All Rights Reserved.